The Quebec ICH conference started this morning with a talk from Anna Steiner, Senior Officer for Intangible Cultural Heritage in the Federal Ministry for Education, the Arts and Culture, Austria. She is also and Deputy Head of Department for bi- and multilateral Cultural Affairs. Ms. Steiner has worked at the Federal Ministry for Education, the Arts and Culture since 1991. She has been in charge of intangible cultural heritage since 2004. Previously, she worked in the Department for International Relations/International School Links and Exchanges and was Deputy Head of the Department for Cultural Policy. Austria ratified the Convention in 2009, but started with implementation of Convention of 2006. Work is carried out through the Federal Ministry for Education, the Arts and Culture. There is a national agency for ICH which works to network, implement the convention, and create a national inventory of ICH in Austria through an online database. Their 24-person advisory council consists of the five federal ministries involved, representatives of nine provinces, and ten experts corresponding to the five domains of ICH, and a chair. The National inventory for ICH in Austria has an application process where local groups can nominate items to the list, such as Viennese Tootling, an urban singing tradition with its origin in the 19th century. There is an application form online, which must be submitted with two recommendation letters and a signed letter of consent. The advisory committee then decides what is listed, and it has listed some 45 elements since 2010. There are no legal or financial implications for listed elements. According to Steiner, some associate ICH with rural traditions, but both rural and urban traditions are important. Currently, there is a focus on knowledge and practices concerning nature and traditional craftsmanship, and not on performance-based traditions, which are already well documented. She gave the example of collective knowledge about avalanches, a body of folk knowledge not understood by younger generations, and how this traditional knowledge can be used to develop cultural strategies to prevent and cope with natural hazards like floods and avalanche protection. 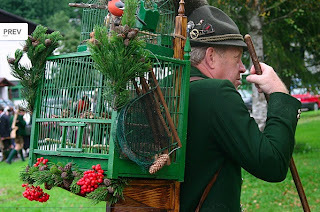 Some listings have been controversial, such as traditional fowling in Upper Austria, which involves catching birds in autumn, a bird-related festival, and then letting the birds free in spring. Animal rights activists complained about the attention given the tradition, but the listing was found to be compliance with the criteria of the convention as well as with local law. Steiner concluded by saying that the Austrian ICH list has received good press coverage, which contributes to public knowledge, but a careful approach has to be found to ensure that listed items do not change because of tourism. She also believes that their work represents the beginning of a process, as interest in ICH growing fast. She predicts an increase in applications to their national list. Austria is currently making two applications for Representative List of the ICH 2011: the carnival of Imst, a masked procession of carnival characters; and falconry.